I was corresponding with a reader the other day and she asked what I thought was a terrific question. The question was this: on the thru-hike I have scheduled to begin next month, what am I going to do differently than the last time? One of the things I’ll do differently this time down the trail is to linger by, instead of hurry past, Marie Lake. 1. More and longer breaks. I intend to walk the trail in nineteen days this time, one day longer than I took in 2009. During that trip I would often pull into my campsite mid-to-late afternoon. On only three days did I arrive later than 5 p.m. One of the reasons I managed to pull in so early, even though I am a slow hiker, is that I took few breaks and a short lunch. This time I intend to take at least an hour for lunch, and take a morning and afternoon break of nearly as long. I even have some spots picked out where I want to linger, like Marie Lake, Sallie Keyes Lakes, Dollar Lake and the Rae Lakes area. The reason for this is simple: I want to spend more time getting to know the Sierra; I’ll need to make my miles each day, but I also want to stop and enjoy my surroundings. 2. Better food. 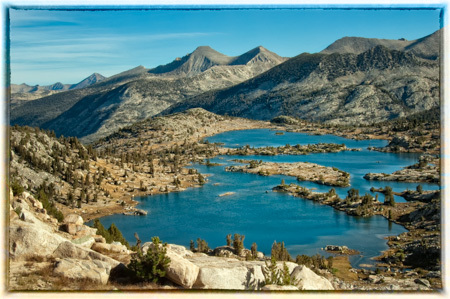 Although I have completed more section hikes of the John Muir Trail than I can count, I’ve only thru-hiked it once. My main goal on that hike was to finish, so I did everything I could to push the odds in my favor, including hiking as light as possible. That meant no stove, no fuel and no cooking. Although I never tired of my tasty breakfast (granola, nuts, dried fruit, and powdered milk), the energy bars I limited myself to for the rest of the day became boring, tasteless, and hard to swallow, literally. This time around I’m bringing a stove and some dehydrated meals. It won’t be four-star dining, but it will at least be something I’ll have an appetite to eat. 3. Better leg planning. Last time, I used a software program called National Geographic TOPO to plan my hiking distances and campsite for each day. That worked pretty well, but I discovered that the distances I estimated were often wrong. On one particular day, when I hiked from Lower Cathedral Lake to the end of Lyell Canyon, my “estimate” was about ten miles. The actual distance was closer to fifteen. 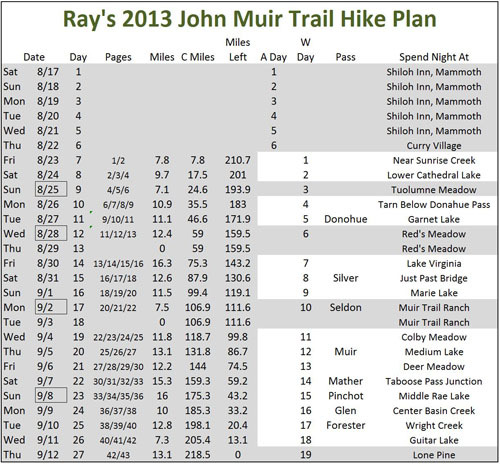 (This was one of the nights I pulled in well after 5 p.m.) This time around I am using a spreadsheet of milestones available if you are a member of the Yahoo John Muir Trail online group. The mileage data on that spreadsheet is much more accurate, and by using it I’ll be able to better plan my daily exertions. By the way, my formula for planning is thirty minutes per mile, plus thirty minutes per thousand feet of climbing. I often do better than that, but almost never do worse. You, too, can develop a good planning formula by keeping track of your hiking times. also, did you have any food dropped between muir trail ranch and kearsage pass? Good luck, Carol. On my last hike I saw two mother/daughter teams and both made it to Whitney! Some of the things I would do differently next time, Ray, are: 1. Take time to fish; fish were rising in every lake I camped by, and I would love the variety they would bring to meals. 2. Take fewer photos. My iPhone 4 made picture taking so easy, I took 1,300 photos, which gave me a nice slide show, but slowed me down and took me out of the moment; I’ll do more of just experiencing and appreciating. 3. Start and stop earlier each day. Had several late-night finishes and missed too much scenery hiking in the dark—for instance, over Glen Pass. 4. Start my trip on time. Due to business intrusions, started from Yosemite Valley three days later than planned. This meant I had to make up three days in order to resupply and meet a friend on schedule who joined my hike at Onion Valley trailhead on the other side of Kearsarge Pass. This led to my number 3 challenge. Agree with all your points. And however, you do this hike, it’s a mind-blowing, life-altering experience. Hi Ray, will you be doing a daily video diary of your thru-hike like you did the first time? Good question, Ron. I tended towards short days at the beginning of the hike (day one: 8 miles, day two: 9.6, day three: 7.1, etc.) and then hiked a little longer later in the hike, when my body had adjusted to the exertion (day fourteen: 15.3, day fifteen: 16). What’s equally important as distance for the day is the amount of climbing. The most important tool for daily mileage planning is a profile of the hike!